In 2001, UVLT became the first non-profit group in the country to receive a direct grant from USDA/NRCS for farmland conservation. 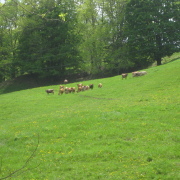 We bought an easement on these fields in Lyme. USDA embraces â€œALEâ€ and UVLT moves to tap more great projects! With the passage of the 2014 Farm Bill, the US Department of Agriculture effectively ended the Farm and Ranch Lands Protection Program (known by its acronym â€œFRPPâ€) and replaced it with the new Agricultural Conservation Easement Program (â€œACEPâ€).Â Under FRPP the Upper Valley Land Trust has had enormous success conserving farmland in both New Hampshire and Vermont (most Vermont farm projects are completed in partnership with the Vermont Housing and Conservation Board).Â UVLT has used federal farmland funds to purchase many conservation easements on property with high percentages of prime or statewide-significant farmland soils. 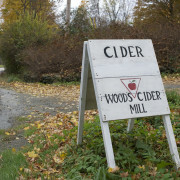 Some early projects included the Wilmot Farm in Lyme and Knoxland Farm in Bradford. 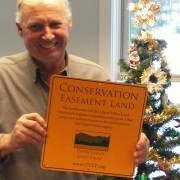 The federal government canâ€™t resist acronyms of all kinds, so it has not only re-labeled this program, but also established a new label for the conservation easement deed that will be used under ACEP for important farmlands.Â The Agricultural Land Easement (â€œALEâ€) will maintain the purposes of conserving valuable agricultural soils by limiting development, mandating best practices to preserve both soil and water resources, and outlining the interest of the federal government in seeing these lands protected in perpetuity for farming.Â UVLT works closely with the landowners during the easement process as well as after the conveyance, when our stewardship commitment to monitor the farms and check in with the landowners each year helps deepen the relationships we develop with each farmer into the future. 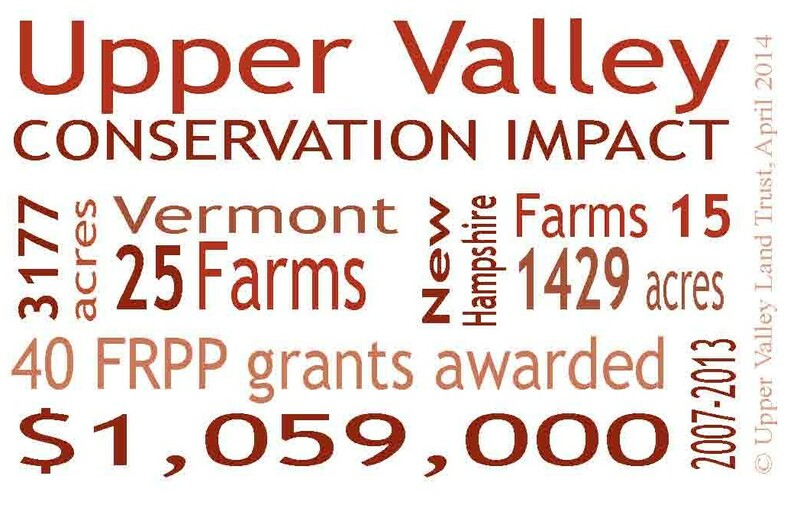 UVLT staff will continue to work diligently with our federal partners in both states on projects approved under the last FRPP grant awards â€“ these include the Richardson Farm in Hartland, Troy Farm in Bath, and farmland along Clay Brook in Lyme â€“ while also learning the new rules that are being drafted for ACEP and ALE.Â An effort to conserve key supporting lands of Thistle Hill Farm in Pomfret is underway and, if funding is approved this spring, will move ahead under ACEP. UVLT landowners and farmers continually rely on the knowledge and expertise provided by our organization, and while grant funding programs can be lengthy and complex, UVLTâ€™s success in farmland conservation on both sides of the river speaks to our commitment to protecting valuable agricultural soils for the future of the region and making this process as manageable as we can for all. Partners in the Natural Resources Conservation Service (the branch of the USDA that runs farmland conservation funding programs) have been relaying updates about their progress for developing new forms and getting program rules together that should ultimately streamline the process which is a primary goal under the new Farm Bill.